This is mostly a place for our family to sell stuff, mostly hobby-related, that we don't need any more. 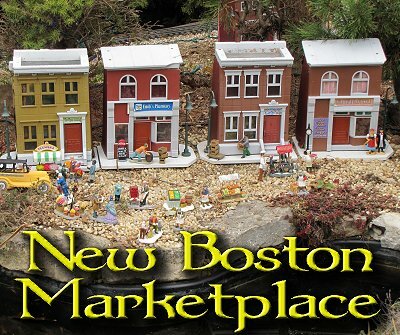 It's named after the six-building metropolis "New Boston" on our garden railroad, which is in turn named after an early, but later abandoned, pioneer settlement down the hill from hour house. Folks who've known us a long time know that I started buying garden trains and setting up temporary railroads in the 1980s, long before I started any of my web pages. In those days, I went to lots of train shows and conventions and came home with bargains I knew I was going to be using soon. Frankly, I had more enthusiasm than I had money, so I "saved money" by buying things with minor parts missing, cosmetic damage, etc. 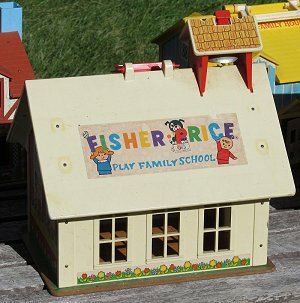 After all, I had many fond memories of extensive model-building, scratch-building, and kitbashing from the (indoor) model railroading days of my childhood. On the other hand, when I was a kid, I wasn't a parent and a homeowner, and I never had a full-time job, much less two jobs, which I've had much of my adulthood. I succeeded with a number of projects, but, frankly, a lot of them have just been taking up space. Give kitbashing friends access to things they can use to build other things. Hopefully, moving this stuff out will also give me room to store - or maybe even work on - the stuff I want to keep. I'll point out that none of my web pages actually sell anything - they're supported by advertising. The products I'm listing here were purchased with my own money for my own use and are being sold as such. In fact, most of them were purchased before I even started my web pages. If I ever start retail selling of merchandise on my web pages, that will be a different story, and it won't EVER get listed here. Why Isn't There More Stuff on This Page? 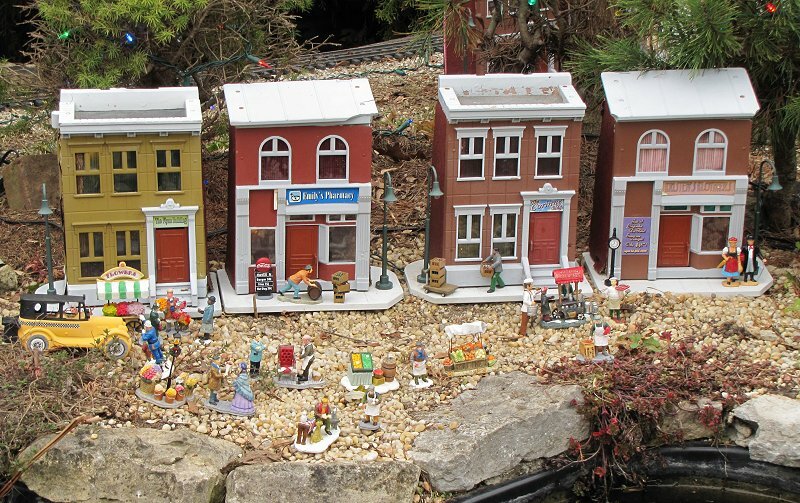 Because I belong to a great, growing garden railroad club - the Miami Valley Garden Railway Society, and I try to give our members "dibs" on anything I list. In fact, I had about a dozen more listings here before the last club meeting. But stay tuned, more stuff will become available after my next "pass" through the train shed. A few friends have asked if they could list stuff here as well. If I add any listings for friends, I'll point that out. All interactions between you and other people (besides me) are up to you guys to sort out, though. I'll want to hear about it so I can keep nasty people from buying or selling here, but I won't be sorting out arguments between third parties. At this time, the stuff I'm posting here is intended primarily for local sales to folks who are willing to drive to the western edge of Springfield OH to pick it up, or to meet at an MVGRS club meeting for a pre-arranged exchange. Checks are fine from Dayton, Cincy, or Columbus-area club members or folks I already know. If you order long-distance, I can send you Pay-Pal instructions, or you can send me a check, but I may "sit on it" for a few days to make sure it clears. If the stuff doesn't sell from this page, it goes on eBay next. Also, I will combine shipping if possible, but some of these things are so large they pretty much take up the whole box, so I won't promise ahead of time. All sales are "as-is," as reflected by descriptions that attempt to list any perceieved problems and by setting prices that are much less than you'd pay even from a discount dealer for the same item new. Shipping fees will be listed per item. I prefer USPS ground, but if you want something fancier, and you're willing to pay the difference, please let me know. Insurance is a required add-on for every purchase, and checks will be held until they clear for sure. If something doesn't sell here after a reasonable period, I'll list it on eBay. Once it goes on eBay, though, it will no longer be available for private sale and you'll have to go through eBay like everybody else. If you decide you really have to return something, you pay shipping both ways. And if it comes back in a different condition than it went out, I may reduce your refund accordingly. Also, any of my friends' stuff that's listed here is subject to exactly the same terms, including "as-is," "no return," "local sales preferred," "shipping fees are non-refundable," "insurance is required," and "subsequent posting on eBay will remove the item from further eligibility for private sales." 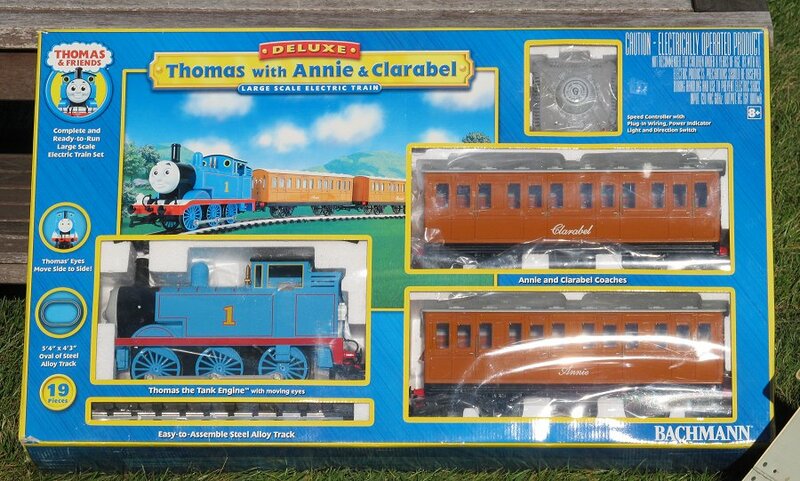 So as I'm cleaning out the "train shed," if I come across something that I can't use, or won't have time to put together or fix up, I'll list it here at what I consider to be a very fair price in the hopes that it will do someone else good. Again, this list gets longer and shorter with time, so check back. 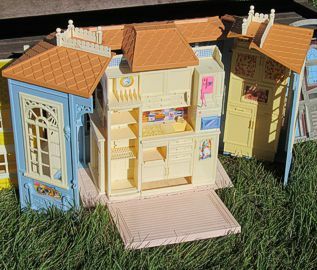 Update, August, 2013 - This month I'm clearing out several toy buildings that I accumated because I was going to "trashbash" them into model houses and churches as I already had done with similar buildings. I realize now I'll never have time to do the rest of them, or space on my railroad to set them if I do. 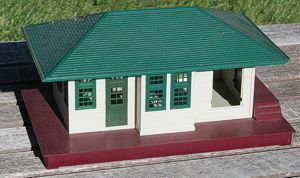 For the two classes of buildings I've already trashbashed successfully, I include a list of what it took to make them into attractive, believable miniature structures for my garden railroad. 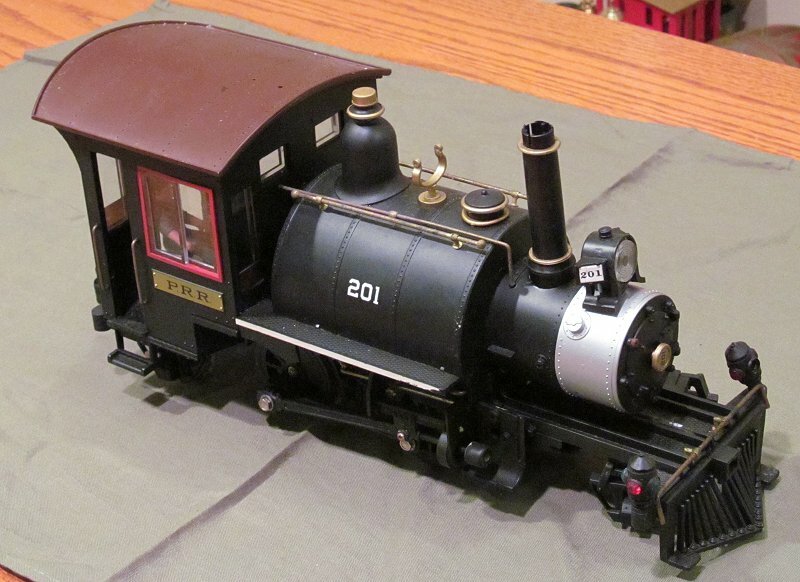 I've added two more locomotives that need work, in case any readers have more time than I do. 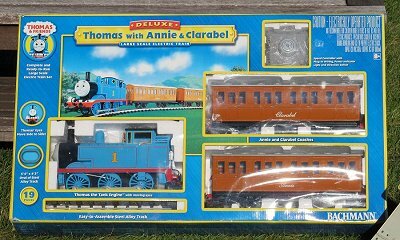 I bought this set to compare to the old Lionel sets I've been setting up for kids since 2007. The article I wrote about it is here. I never got the track or power supply out of the box, and the train has run maybe an hour. So, consider it new. Asking $200. Shipping would be $40. Email trainlady AT donet DOT com. Update, 8/8/2013: Price reduced: Asking $180. 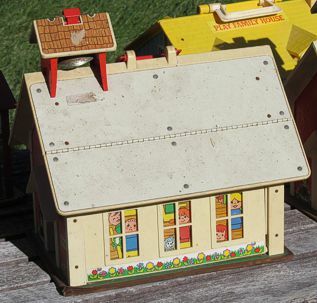 Like the Cape Cod I repurposed, I had pretty good luck "trashbashing" one of these into a very nice church building. So I've kept an eye out for them at flea markets and garage sales. 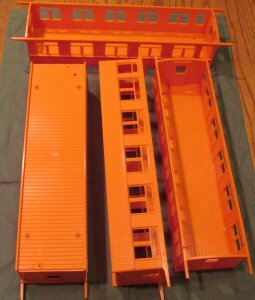 However, they do have a pretty big "footprint," compared to most kit buildings, so I won't have room for more than one of them anyways. Soaked the stickers off the roof. 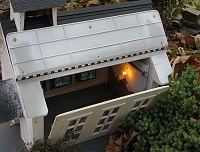 Drilled out the little rivets holding the "chalk-board" in place so the windowframes on that side would be unobstructed. Sawed off the little lever that rings the bell and glued a bit of vinyl siding trim (left over from my house) over the bell tower roof to cover the hole. Used another bit of the vinyl siding trim to extend the porch roof. Cut a piece of L-shaped plastic from Evergreen or Plastruct (I forget which ) to camouflage the holes from the handle on the main part of the roof. 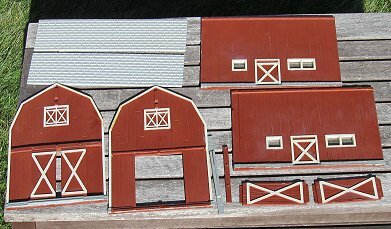 Primed the roof, then painted all the roof elements with "trunk paint" to give them texture. Then I painted over the trunk paint with flat black to protect it. 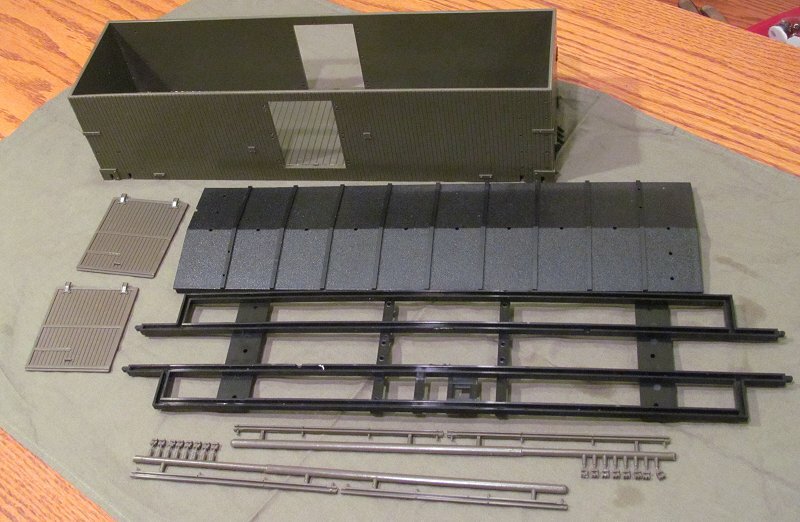 But I left the roof hinged, so I could store stuff like track cleaning pads inside. You would have thought that the "piano hinge" would have rusted out by now, but it hasn't. Glazed the windows with Lucite - a very easy task on this one. Printed a stained glass window pattern on plastic film and glued it in place. Okay that's a lot of work. But I wound up with a very nice structure that only cost me a few dollars and is actually a more realistic size than the kit churches. 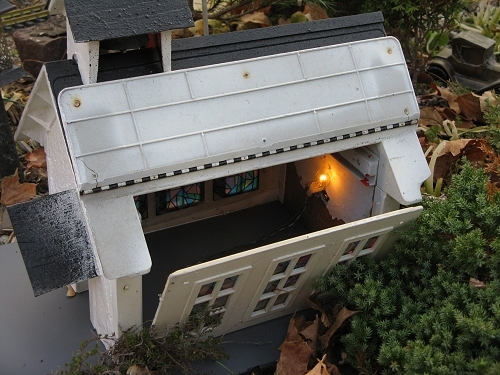 Once I added lighting, the stained-glass windows added a very nice touch to evening viewings. 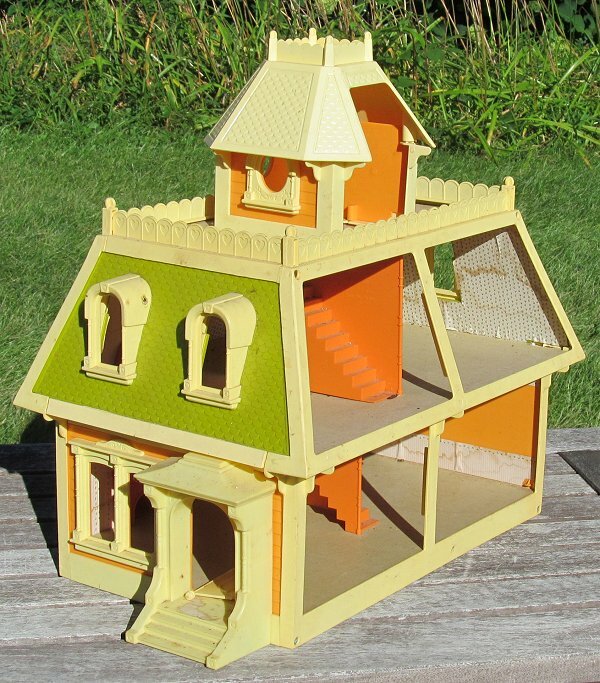 None of the structures I offer for sale this way is in good enough condition to give to little kids to play with, so you don't need to feel bad about repurposing them. 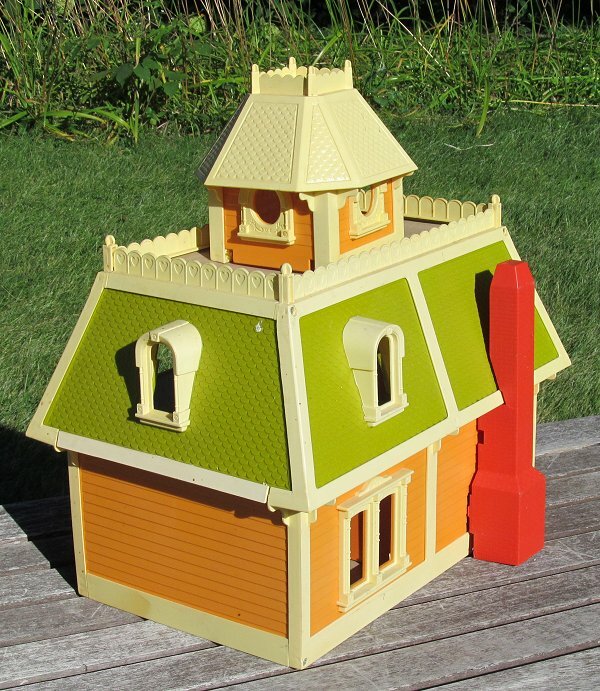 Update, 8/8/2013: The Schoolhouse now includes precut pieces of scrap plexiglass for replacing the base and ends of the buildings. Here's a very rare piece I picked up with the idea of trashbashing into a "nob hill" home or maybe a haunted house. 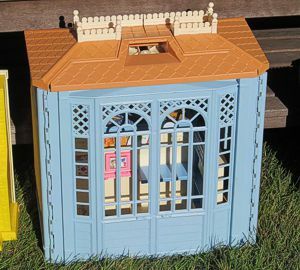 The doors and windows are a little larger than most Large Scale OR Fisher Price buildings, but not so you'd notice unless you set it near a Piko equivalent. To use outside, you'd have to paint, replace the masonite floors, and fill in the fourth wall. This is also missing one of the front doors, but I was planning on using smaller doors and adding a transom window anyway. I know almost nothing about it, except that the last time someone asked me to track one in good shape down for her I could only find one, which wasn't cheap. Unlike the other Fisher Price structures on this page, it hasn't been abused, but it HAS sat in a window long enough for the tile pattern to fade almost completely from the masonite "roof." For indoors, of course, you could resurface that with almost anything. For outdoors, you'd have to replace all three floors anyway. Update, 8/8/2013: Price reduced to $20. Most of the station is actually here, but the chimney is missing, part of one roof corner is chipped off, and the station is missing a window and (I think) a bench. I bought it to fix up and use when I used to set up O scale trains outside for our Christmas-themed open houses, but it was never actually used outside. Update, 8/8/2013: Price reduced to $15. 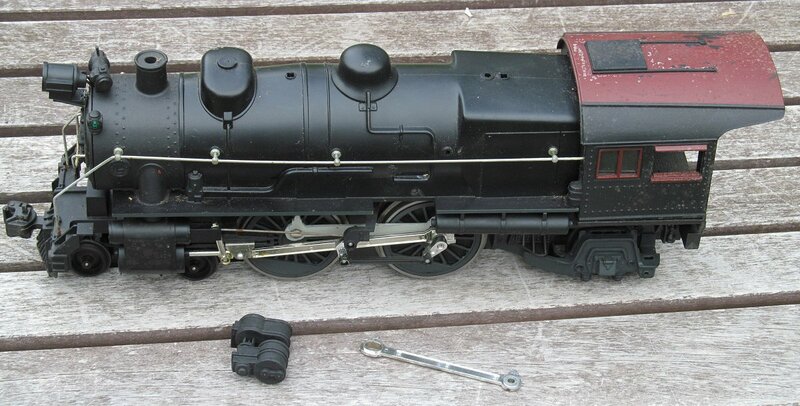 This locomotive looks nice enough, but being first-gen has more plastic parts than the more recent locomotives. When running on uneven track it binds every so often and causes your the power supply to spike. I couldn't figure it out, so I sent it to Aristo and they charged me $20 to say there was nothing wrong with it that loosening some of the screws in the running gear wouldn't solve. But it still binds more than it should. I don't have time to troubleshoot it. Update, 8/8/2013: Price reduced to $225. I bought this with several pieces missing years ago, ordered the replacement parts, and got it running. I never could find a replacement for one side rail, but I got it fixed up enough to be my "main" locomotive for several years. Then I stopped using it for about fifteen years. When I recently got it out of storage, I noticed some minor pieces had come loose, mostly because the glue I used years ago had given out. The headlight is loose. The pump is off. Since I took this photo, the valve gear hanger on the right side has also come off, but I have those pieces in a little bag. Mechanically, the motor runs great, but the little rivet that holds the eccentric on one side has worked its way out. One of the "paperclips" that connects the valve gear is missing, but those pop off every so often anyway, and they're easy enough to replace. The bell and pop valves are missing period, but they're not hard to find. 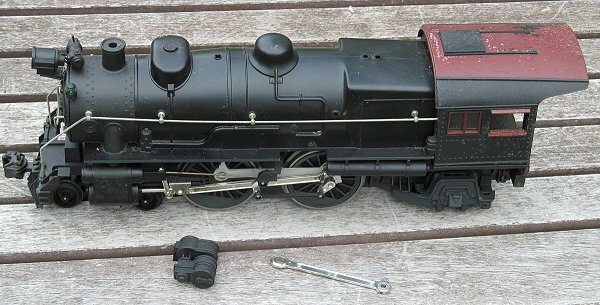 In the photo you can see a connecting rod that I recently came across to replace the home-made one I put on years ago because Lionel was out of parts. As a very minor point, the Floquil Tuscan Red I painted on the cab roof years ago is peeling off. Of course, now, I just use "rust primer," and forget about trying to be "exact" about this color. In other words, the boiler/cab shell, the steambox, pistons, most of the running gear, the motor, the wheels, and the drivers are all fine. I suppose you could send the shell to Barry's Big Trains and get him to make you a 10-wheeler or Consolidation out of it. Or you could probably fix it up or kitbash it into something else yourself. Update, 8/8/2013: Price reduced to $85. I got this in an auction, then realized that half of the roof is missing (there should be four pieces). The rest of the barn is there, though. The other "problem" is a few minor glue streaks which could be easily painted over. 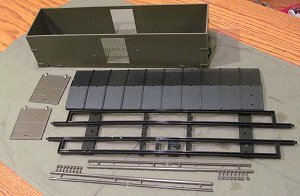 I kept the pieces in a box figuring I'd fabricate the other two pieces of roof, or replace the whole roof with crimped aluminum or something. 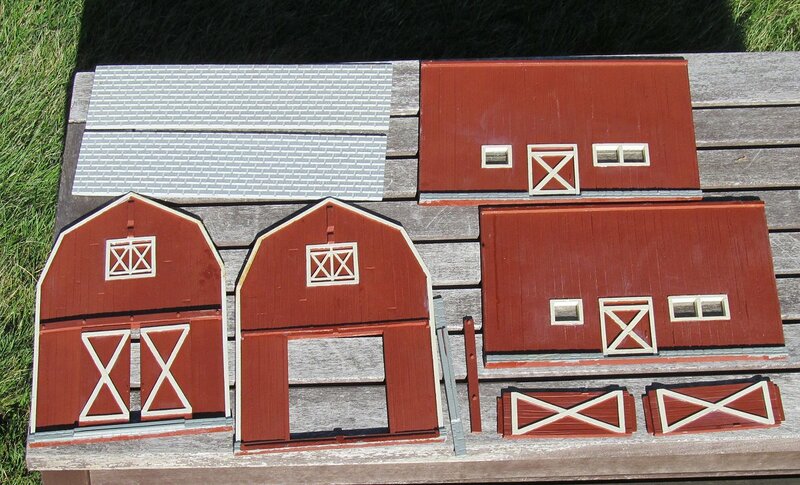 But in the meantime, I've picked up another barn, and I don't really have room for this one anyway. The nice thing about this (when it's complete) is that it has a high profile, so it makes a nice addition to your railroad, but it has a small footprint, so it doesn't "take over." Okay, this isn't the sort of thing I usually pick up. When I saw it, I didn't even know what it was, but I liked the big atrium windows and thought about carving it up to use the windows on a station or something. That never happened. It wasn't until I was getting stuff out for this sale that I looked it up and figured out it was a Barbie accessory. 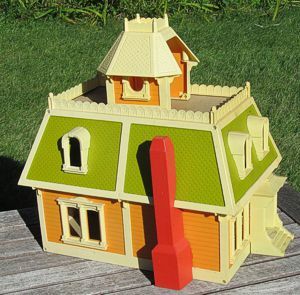 Of all the toy buildings on this page, this is the best candidate for cleaning up and giving to kids to play with. Or carve it up yourself, if you wish. Update, 8/8/2013: Price reduced to $5. Okay, this one was my fault, sort of. A raccoon got into the garage and knocked it off of a shelf and I didn't notice right away that the cylinder on the right side was missing. It still runs, though I confess it was a little sluggish before I retired it. Oh, and the rubber traction tires are shot, and it's missing a little ring that goes around the smokestack. It's missing the bell, too, but they're ALWAYS losing the bell. Update, 8/8/2013: Price reduced to $10 per kit, or all four for $30. 4 Delton Coach Bodies, never used or painted. 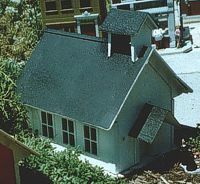 From the same molds currently used by HLW. Update, 8/8/2013: Price reduced to $10 per shell, or all four for $30. As I said, more stuff will come online the next time I make a pass through the train shed, so check back once in a while. In the meantime, enjoy your hobbies. Especially enjoy any time you have to spend with your family in the coming months.